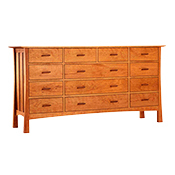 The Vermont Furniture Horizon 13-Drawer Wide Dresser is hand-crafted from the finest solid wood. It has a classic yet contemporary craftsman styling with curved legs and pulls highlighting it's Art Deco influence. All product is 100% solid wood in cherry, maple or walnut. No plywood, MDF, or particle board is used and all are hand-rubbed with an environmentally friendly linseed oil finish. 20"H x 75.7"W x 38.75"D. Hand-crafted with either solid cherry, maple or walnut wood. 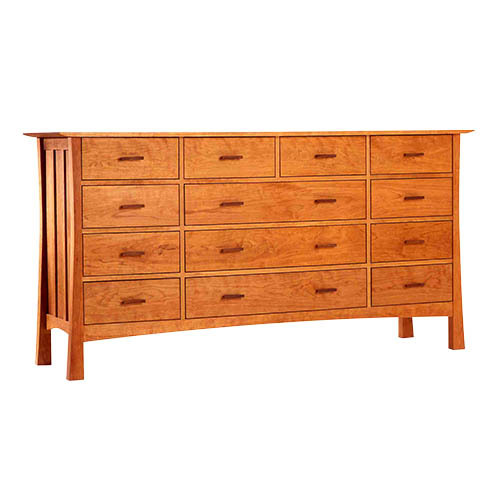 Our Vermont Furniture Horizon Drawers adds a simple yet bold touch with the gracefully curved legs and Art Deco influence made with durable hand craftsmanship. With an emphasis on color, grain selection and matching boards, each piece is hand-crafted using traditional techniques such as mortise and tenon joinery. With so much time spent relaxing and sleeping in your bedroom, having a enduring, healthy and pleasant surrounding is important to wake up to each and every day. The Horizon style equally fits well in a sophisticated or a casual setting for years to come. Choose between solid cherry, maple or walnut wood. Dimensions 20" x 75" x 75.5" x 38.75"